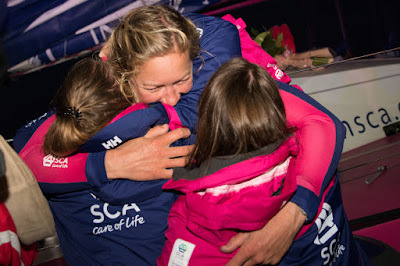 Skipper Sam Davies (GBR) and her Team SCA crew struck a resounding blow for women’s offshore sailing in the early hours of Thursday morning when they gloriously clinched Leg 8 of the Volvo Ocean Race. 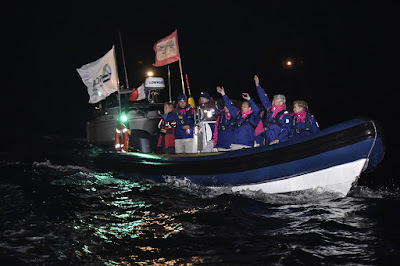 The comfortable victory was the first leg win in offshore sailing’s toughest challenge since Tracy Edwards’ Maidenclinched two stage wins in Class D of the 1989-90 race, won overall by Sir Peter Blake’s famous Steinlager2. At least as satisfying for the first all-women’s crew to enter the race in 12 years will be the opportunity to silence critics who suggested that they were looking outclassed in the current 12th edition by their experienced male rivals. 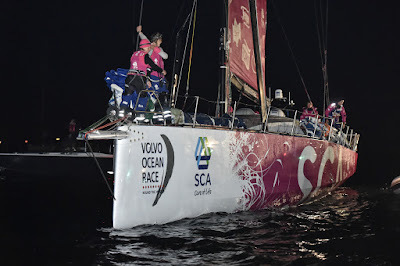 True, the Swedish entry had yet to win a podium place until now, but the crew has clearly improved leg after leg and many observers felt that a breakthrough performance was just around the corner. 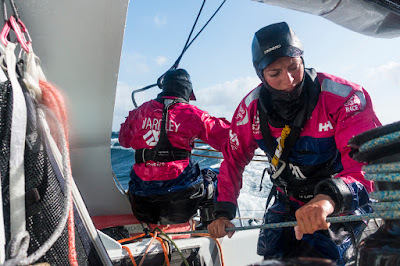 They grabbed the 647-nautical mile leg from Lisbon by the scruff of the neck on Monday, and strengthened that grip on Tuesday after taking an offshore course while most of their rivals hugged the Spanish and French coast approaching the Bay of Biscay. Behind them, another fairy-tale was unfolding as Team Vestas Wind (Chris Nicholson/AUS) closed to a remarkable second-placed finish in their return to the race after six months out following a collision with an Indian Ocean reef on November 29during Leg 2. Nicholson had every reason for the huge smile on his face as he approached the port of Lorient following a near perfect race from Lisbon starting on Sunday. He had simply hoped that his boat could negotiate the leg without mishap and be competitive – a high podium finish is almost beyond his wildest dreams. "It's a very special moment," said the team's Onboard Reporter, Brian Carlin (IRL), simply. Astern of the leading pair, third-placed Abu Dhabi Ocean Racing (Ian Walker/GBR) were nearing an ever bigger prize than the handsome silver leg trophy claimed by Team SCA. 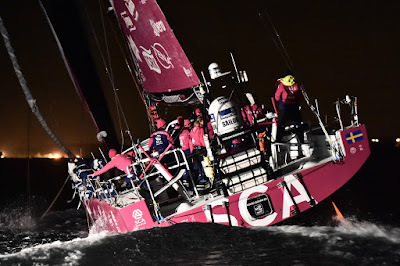 They needed simply to finish ahead of their nearest overall pursuers in the standings,Team Brunel (Bouwe Bekking/NED) and Dongfeng Race Team (Charles Caudrelier/FRA), with a boat in between, to be all but be sure of winning the 12th edition of the Volvo Ocean Race. 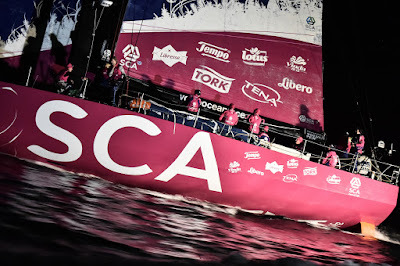 As Team SCA passed the finish at 0211 UTC/0411 local time on Thursday, that prospect looked very much on with MAPFRE (Xabi Fernández/ESP) in fourth, Team Brunel fifth, and Team Alvimedica (Charlie Enright/USA) keeping Dongfeng Race Team at bay in the fight for sixth. The boats will have a short maintenance period before Sunday’s SCA In-Port Race here in Lorient, before the fleet set sail for Gothenburg via a much-awaited pit-stop in The Hague, on Tuesday, June 16. It promises to be a period of considerable celebration for at least three crews of very, very happy sailors.